It's New Brew Friday and today we're coming from the wonderful Monk's Cafe in Philadelphia for this extra special bottle Cantillon 20 Ans d'Amite. 20 Ans d'Amite was created by Jean Van Roy of Cantillon to celebrate the 20th anniversary of Monk's Cafe and the 20 years he has been friends with the owner Tom Peters. 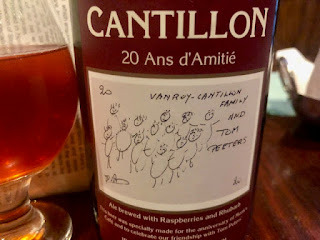 This beautiful lambic is a blend of Cantillon Nath and Lou Pepe Framboise with Nath being the majority at 70%. It's light and fruity with delicate flavors of rhubarb, vanilla, raspberry and funk with a refreshing finish. This was a delightful bottle to both drink and to purchase as the label is just perfect for the occasion. 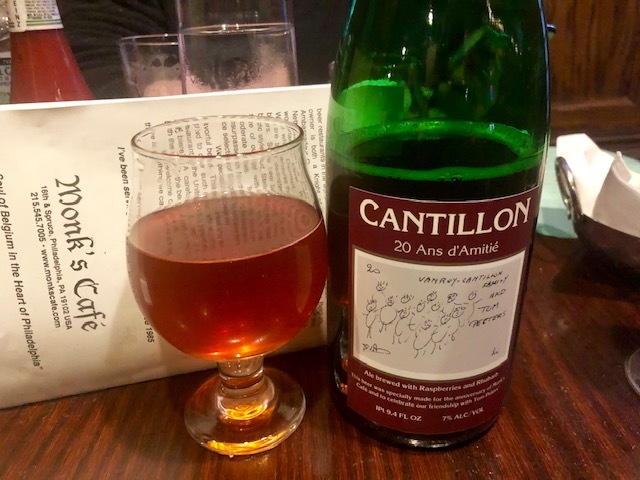 This bottle is only available for on-site consumption at Monks Cafe in Philadelphia. We were lucky enough to drink it both on draft and in the bottle at the Monks/Sierrea Nevada Camp Fire Relief charity event last Saturday. An incredible beverage for an incredible cause. Cheers!